BANGI, 17 December 2014 – Every school pupil who attended the PERMATAPintar centre summer camp programme at The National University of Malaysia (UKM) should apply to study at the institution in the future. 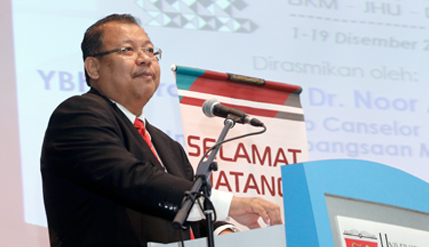 UKM Vice-Chancellor Prof Datuk Dr Noor Azlan Ghazali said UKM’s PERMATAPintar programme was so good that the 400 selected youngsters – aged between 10 and 15 – would be sufficiently impressed with the University to apply there as first choice. Closing the three-week Johns Hopkins University Centre for Talented Youth school holidays summer camp (PCS JHU-CTY) programme here today, Prof Noor Azlan described them as being ‘very special’ since they qualified after going through a very stringent vetting process to ascertain whether they are truly gifted. “There must be something in you that our system which has been given recognition from around the world spotted,” he said. The pupils were selected from schools all over the country using two sets of online IQ tests — UKM Test 1 and UKM Test 2 — which assessed their mental age which must at least be three levels higher than their chronological age. Just 400 were then culled from a total of 10,000 children. Prof Noor Azlan said those selected have to ‘stand out’ from the rest and be very competitive. “Academic excellence alone is not enough. There are other talents in you which must be brought out. We designed programmes that would allow you to do that and show how gifted you are,” he said. Prof Noor Azlan said no one is excluded from being excellent. He expected that 30 years from now many of them would grow up to become professors from UKM saying all UKM can do is to provide the opportunity and facilities. The rest is up to the youngsters to make good their talents and channel their brilliance to reach great heights. “If you win the Nobel Prize, remember that the PERMATAPintar programme and UKM made it possible for you,” he said. The camp had various activities related to Science, Technology, Engineering and Maths (STEM). The children were required to carry out various projects such as robotics, aviation and rocket science. More than 3,000 students have participated in the programme managed by UKM’s PERMATAPintar since its inception in 2011.